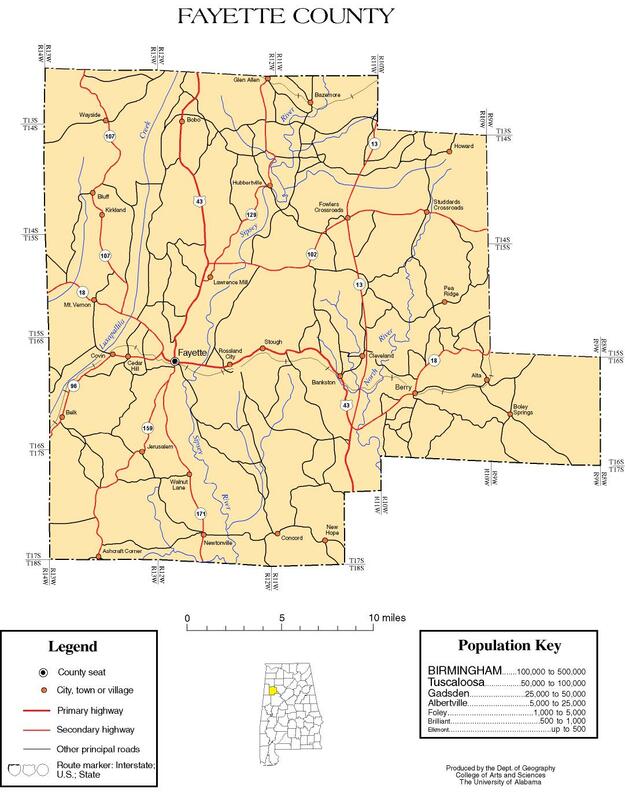 Fayette County population 1s 17,241. Its county seat is Fayette, Alabama. Located in the Southern Automotive Corridor, Fayette is near several of the world’s major automobile producers. With two home grown second tier companies, Fayette Fabrication and Custom Automotive Services, located in the city, Fayette has grown to provide skilled workers and products to this expanding segment of our state and regional economy. Originally called Luxapallila, the Winfield area has been inhabited by settlers of European descent since the 1830s. Belk is located in western Fayette County. It is on the east side of the valley of Luxapalilla Creek, a southwest-flowing tributary of the Tombigbee River. Alabama State Route 96 runs through the town, leading northeast 7 miles to Fayette, the county seat, and southwest 12 miles to Millport. Columbus, Mississippi, is 34 miles to the southwest. In November 1883, the town of Berry was incorporated; the town limits being set by measuring one mile in all directions from a public well dug a short distance from the depot. The first store and post office was operated from a boxcar by Ab. Seay even before the track of the railroad was completely laid. Glen Allen is a small town located in the northern most end of Fayette County. A portion of the town limits cross over into Marion County, but the town is one of four incorporated municipalities located within Fayette County. First known as Stewart’s Gap after a post office located there in 1877, Glen Allen derived its current name from the last names of two engineers who worked on the railroad (probably the Kansas City, Memphis, and Birmingham) that came through the area in 1885. The town was laid out along the rail line in 1889 and lots were sold. Gu-Win’s unusual name is reportedly taken from a combination of two neighboring towns it lies between, Guin and Winfield. When first established, the community was known as Ear Gap and grew up along a railroad line. In the 1950s, citizens in nearby Guin sought to annex Ear Gap, but residents wanted to remain independent and decided to incorporate. Another source for the name origin comes from a theater located in the present-day town, the Gu-Win Drive-In Theater, which was owned by George Thornton. Thornton reportedly convinced locals to name the community Gu-Win after spending substantial money on a new marquee featuring the theater name. Thornton also was the first mayor of the town. The Sipsey River, a tributary of the Tombigbee River flows through the center of the county, while the North River, a tributary of the Upper Black Warrior River, flows through the eastern half. Luxapalila Creek, a tributary of the Upper Tombigbee River, flows south to north through the western half of the county. U.S. 43 runs south to north through the north-central and eastern portions of the county. The Sipsey River is one of the last free-flowing swamp streams in Alabama. The river is popular with canoers and fishermen.